Obviously, we couldn't do a month on treasure and pirates without reading books too. 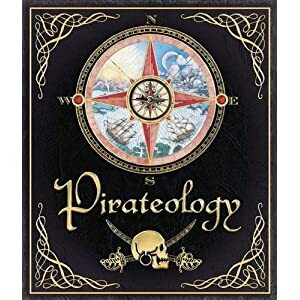 Last year Ebi-kun got the Dragonology book (review here) which we all love, so I got him the Pirateology book for Christmas and it is equally amazing. Before you even open the book the real compass set in cover gets you captivated! As with the Dragonology book, this one is also beautifully written, there is a lot of information but it is broken down so it is easy to dip in and out. Much of it is fact but there is some fictional element to it and there is a disclaimer at the front of the book telling you which parts are fictional. 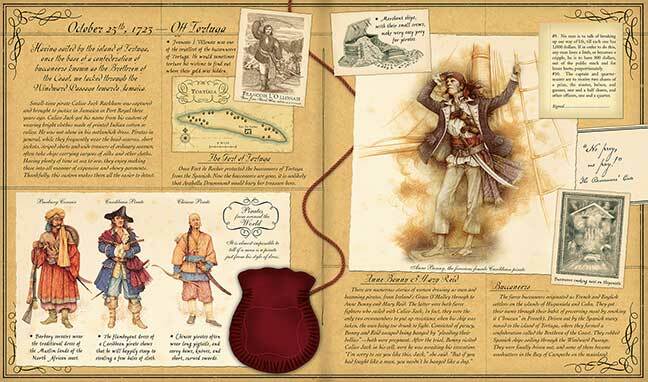 There are fold out pieces, map reading tools, knot tying information, pirate customs, glossary of pirate terms, descriptions of the different pirates around the world, types of weapons and ships and much more. At the start of the book you are introduce to Arabella Drummond and her torn map then later in the book there is a secret pocket with the missing map piece. Ebi-kun only found it last week and he was SO excited, his eyes looked like would pop out! Ebi-kun is six but he has a high reading age, I think the book might be a bit difficult for most kids his age and it is aimed at a slightly older audience. That said, I think he will get a lot out of it and it is one of those books that we will hang onto. We have three of the ology books now and I think they are well worth every penny, books to treasure. Another pirate themed book we have been reading is Troll. What? you say, a pirate book called The Troll, I know, confusing. 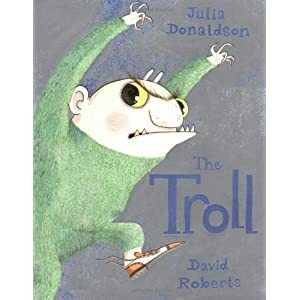 It is written by Julia Donaldson (of Gruffalo fame), it is a bit longer than some of her other books but it is fun and the illustrations by David Roberts are lovely. It is sort of two stories which combine at the end, the troll is trying to catch something other than fish to eat and the pirates are trying to find the treasure, it is silly, it is fun and we love it!